This week we have have had many early mornings and late nights filming and editing a one tonne over stuffed Walrus that is over 120 years old. He is the focus piece in the Horniman Museum‘s Natural History Gallery but this summer he is on loan to Turner Contemporary in Margate for an exhibition called Curiosity: Art and the Pleasures of Knowing. The video is just over two minutes long but because it’s in time lapse it covers three full working days of material. We started by going in a few days early to his spit and polish so that he would be leaving looking his best. There was a very surreal moment when Christopher Biggins arrived to take a couple of shots of the walrus and then disappeared again. Nobody seemed to know why and the museum wasn’t even open yet. Anyway the walrus looked very clean and relaxed at the end of that day. On Monday we did arrive at what we thought was a “very early” 0715hrs to begin filming his departure but contractors and museum staff had been in since 6am to prepare for the moment everyone was very anxious about. Lifting the one tonne gentleman over the cabinets by way of a winch. We did question why they couldn’t just move the cabinets but turns out that the beautiful Victorian casing is much more problematic to move than an overstuffed walrus. There was a lot of excitement in the air, with a slight hint of nervous tension, and there was a lot of interest surrounding the fact that he was getting x-rayed before he left. Apparently this is the first time he has ever had his insides examined. I overheard two Natural History curators casually discussing if they thought any of his bones were still inside. They both agreed that his skull and flipper bones must be there as the shape of them was accurate compared to his over stuffed body. They were of course proved correct. I love it when people obviously know what they are talking about. Expertise at work! To create the sliding effect whilst maintaining the time lapse effect can be done with a very expensive piece of equipment or with a lot of patience. On this occasion we went with patience. We placed the camera on our slider and moved the slider a quarter of a centimetre every three seconds. The result is a dynamic and fluid shot. This is why when the moment came for the walrus to fly over the cabinets I missed the whole thing. I was fully focused on moving the camera a solid quarter centimetre. I managed to get a look of his while he was suspended in the air which was rather awe inspiring. There was a palpable sense of relief when he touched the ground again and applause spontaneously erupted for all those involved. It was a great job, well done and exactly to plan. Heave! Have you ever seen a Walrus fly? 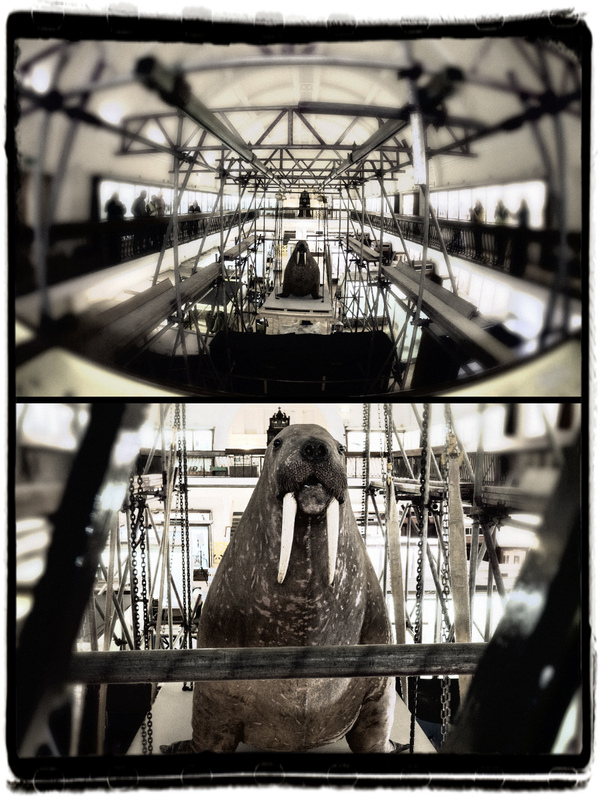 I think I'll have seen about everything, now I've seen @HornimanWalrus fly! After a little bit of crating he was allowed an early night because the next day he was wrapped up, padded and battened into his crate for the journey to Margate. He looked rather peaceful and we decided he looked like he was going to Margate for a spa treatment. His crate was then fully closed up and he was left in isolation. The next morning was another very early start and we all hung around in the gardens waiting for his grand exit. The conditions were arctic, perhaps to make him feel more at home, and after waiting for some time he was lifted into the lorry very quickly and easily. 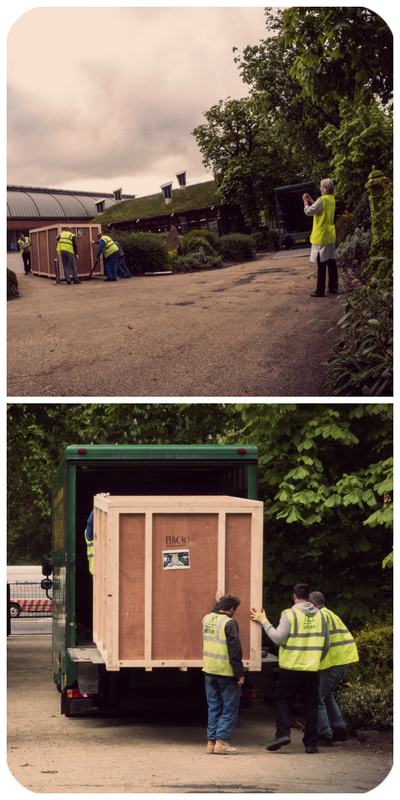 See you back at the Horniman in September! We thought we had very little time to get into position to see him leave the site so dashed off but in reality everyone else went off for a cup of tea and we stood on the south circular in rush hour traffic in windy and cold conditions waiting for everyone to return. In minutes it was all over and off he went to Margate. 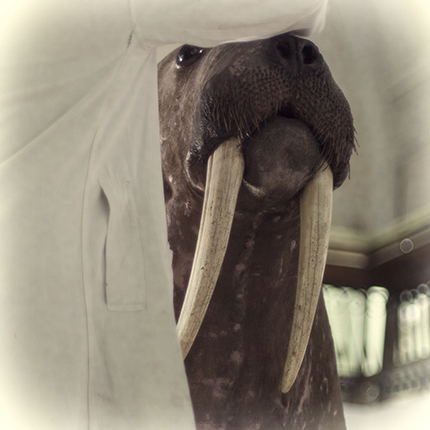 You can read more on the Horniman’s own “live blog” of the events and their very interesting The Great Walrus Move Storify of tweets and instagrams. Story of the move is also on the Telegraph, ITV, Londonist and many other websites. He even made it on to BBC South East news. What a celebrity.